Cairns is the best city to visit in north Queensland. 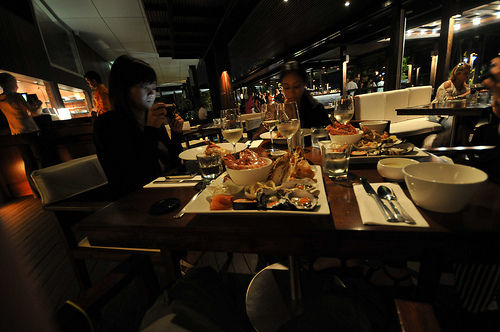 It’s relaxed and tropical, the weather is always warm and it is one of the best places for trips to Great Barrier Reef. 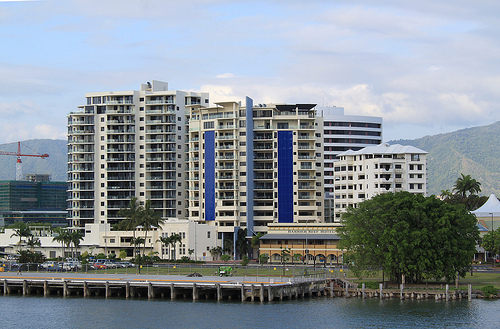 In the city there are Cairns Museum, Cairns Night Markets and the lovely Cairns Marina. Just north are Machans Beach, Wangetti Beach and other northern beaches. Townsville may be the biggest city in north Queensland, but travellers tend to spend longer time in Cairns. Here is Cairns travel information, and in the end of the page is a Cairns map. There is an amazing amount of great things to do north, west and east of Cairns!!! 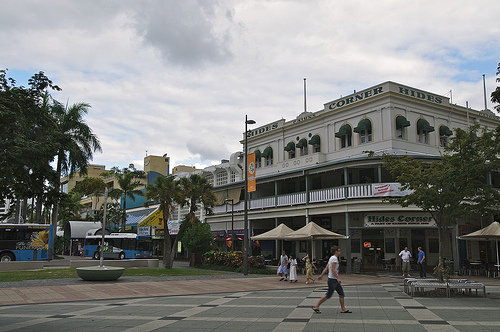 Cairns city center is next to Trinity Bay between Cairns Esplanade and Sheridan Street. Mulgrave Road that comes from south (Bruce Highway) passes by Earlville shopping centre and Parramatta Park Showgrounds before it turns into Aplin Street that goes right to the Cairns Esplanade. The Pier. Poster by AllPosters. Click on thumbnail to buy. If you arrive by train, you’ll first come to the Cairns Central. It is the town’s central train station as well as a large shopping centre with lots of clothes’ shops, camera shops, bookshops, all kind of speciality shops and a large eatery. It is also here as you can catch the train to Kuranda. Across the road from the main entrance of the shopping centre is Shield Street which goes right to the Esplanade. On the way to the Esplanade it passes the City Place – a pedestrian shopping mall, where there are lots of souvenir shops, pubs, restaurants, the City Place Amphitheatre, and Cairns Museum. Along the side streets are Rusty’s Bazaar Markets and Orchid Plaza. There are also plenty of hotels and backpackers hostels on these streets. 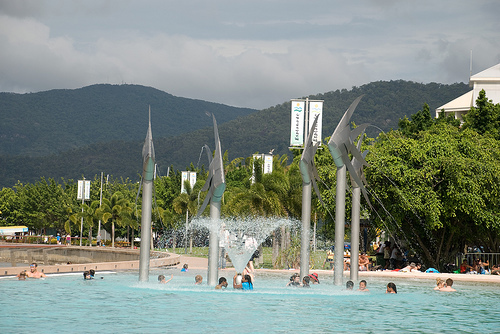 In the northern end of the Shield Street you’ll come to the Cairns Esplanade, and right to the Cairns Lagoon, always full on backpackers as well as locals having a dip or sunbaking in the adjacent park. 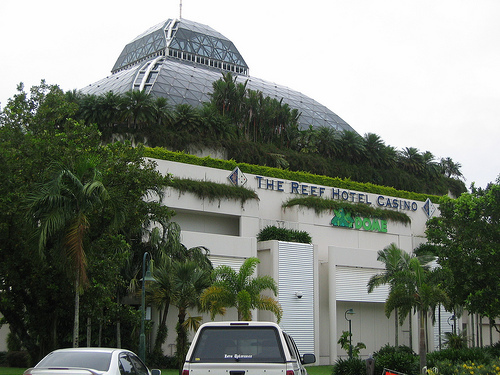 East of the Lagoon is the Cairns Pier – another shopping mall with shops, restaurants and bars, and an Aquarium called Undersea World where you can discover the tropical marine life and watch shark feedings. East of the Cairns Pier is Cairns Marina with lots of yachts and fishing boats, and south of the Marina is the Marlin Jetty; and the Trinity Inlet where you can catch a ferry to Fitzroy Island. Cairns Yacht Club is also here. Marina. Poster by AllPosters. Click on thumbnail to buy. West of the Trinity Inlet is the Reef Hotel Casino, which is much more than a casino – you can stay here (although it’s not cheap); and on the top of it is the Cairns Wildlife Dome – a wildlife park with tropical rainforest and lots of Australian animals such as kangaroos and koalas, but also crocodiles, snakes, turtles, lizards and many kind of Australian famous birds such as kookaburras. Back on the Cairns Esplanade, there is a lovely walking trail with information signs about Aboriginal people and views over the surrounding mountain ranges. There are also barbeques and picnic tables here, and further north there are mudflats that attract many interesting wetland birds such as ibises, pelicans and spoonbills. 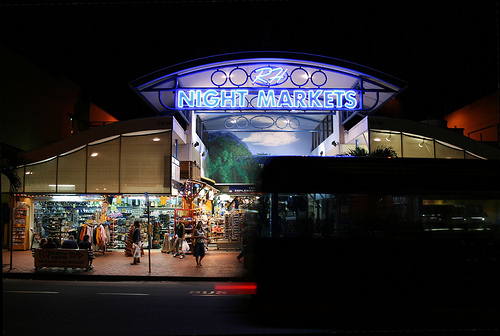 Also on the Esplanade are the famous Cairns Night Markets, a great place to have a dinner in the food court, and scroll through the market stands - there are clothes as well as a lot of souvenirs. 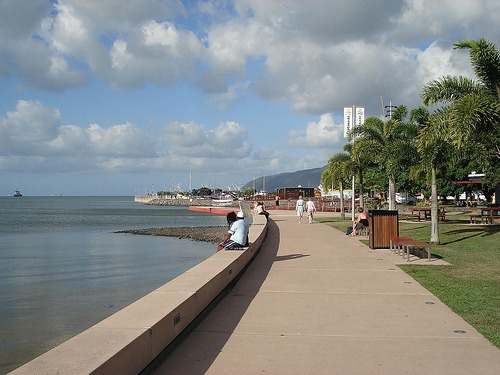 If you keep walking north along the Esplanade, you will come to North Cairns, where there are lots of eateries, expensive hotels but also backpacker hostels, the Tobruk Memorial Swimming Pool and the Royal Flying Doctors Service. North Cairns. Poster by AllPosters. Click on thumbnail to buy. Here are also the beautiful Flecker Botanical Gardens. It is a very green pace to be – amongst lush tropical plants and some impressive large tropical flowers. Botanical Gardens. Poster by AllPosters. Click on thumbnail to buy. Further north, on the way to the airport is a mangrove boardwalk, in the extensive mangrove swampland that surrounds the road to the airport. Mangrove habitat is very interesting and the boardwalk is worth checking out if you like the nature. North of the town are the Tjapukai Aboriginal Cultural Park (there is also a night tour including a big buffet dinner), the Flames of the Forest Dinner Experience, AJ Hackett's Bungy Jump and Jungle Swing (you can also do both, and if you like, unlimited); Cairns Tropical Zoo and Cairns Night Zoo, and the exciting Hartley's Crocodile Adventure. And there is another way to see crocodiles - the Crocodile Habitat Cruise and Crocodile Farm Tour. You can also take white water rafting trips on Barron River, and on the famous Tully River! Another thing to do in the area is hot air ballooning trips over the Atherton Tablelands (they take you to Mareeba from Cairns). One attraction up here is the tropical rainforests, and a great way to visit them is to visit the rainforest village Kuranda, which is also famous for its markets and wildlife parks (amongst others the Australian Butterfly Sanctuary and the Rainforestation Nature Park). The best way to do this is to catch the Kuranda Scenic Railway from Cairns Central Station, and enjoy the ride through some amazing rainforests in the Barron River National Park. And from Kuranda catch the Skyrail Rainforest Cableway back to Cairns, and enjoy the views across the rainforest canopy. In the Cairns end of the Skyrail trip is the world famous Tjapukai Aboriginal Cultural Park, which also has night tours that include a big international buffet dinner - a great way to finish your day. Rainforest train trip. Poster by AllPosters. Click on thumbnail to buy. Another great (actually even better but it's farther), place to discover the beautiful tropical rainforests of north Queensland is Daintree National Park north of Cairns. There is a southern section at Mossman, and a northern section north of Daintree River, in Cape Tribulation. The simplest, and a great way to do that on a day trip is to take a Daintree, Mossman Gorge and Cape Tribulation trip from Cairns. There is also another one that includes an Aboriginal walk, a crocodile watching tour and a visit to a tropical fruit farm, and there is an Aboriginal Cultural Daintree Rainforest Tour. 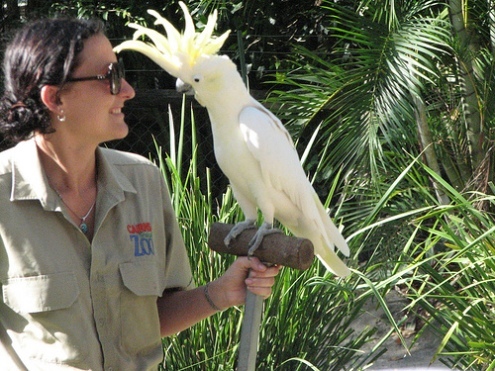 And there is another one that contains the Daintree rainforests as well as Wildlife Habitat Nature Park in Port Douglas. And you can go even further north! There are also trips that include Cape Tribulation, crocodile watching cruise and Bloomfield Track that goes to Cooktown. And there are also one day and two day trips (via Bloomfield Track) to Cooktown. Daintree Rainforest. Poster by AllPosters. Click on thumbnail to buy. Great Barrier Reef and Kuranda in one day tours, the Reef and Rainforest Tandem Skydive, and Cairns skydive and Great Barrier Reef in one day. Coral reef trip. Poster by AllPosters. Click on thumbnail to buy. It is also fantastic to watch the Great Barrier Reef from the air. There are thirty minute scenic helicopter flights over the Great Barrier Reef, and private helicopter tours with island snorkelling and gourmet picnic lunch. You can also combine a Great Barrier Reef Helicopter Tour and Cruise, and you can combine the GBR with another destination on the same flight, sich as on a Barron Gorge, Kuranda and Beaches Scenic Helicopter Flight, or a Barron River National Park rainforest and the GBR on a combined one hour flight. And finally - You fly - with the Cairns Helicopter School! Views from flight. Poster by AllPosters. Click on thumbnail to buy. The two islands closest to Cairns, perfect for a day trip or a longer stay, are Fitzroy and Green Island. Green Island is a coral cay and a great place to watch corals while snorkelling, diving, or taking a glass bottom boat tour. The only place to stay is the Green Island Resort; and the cheapest way to get here is by taking the day trip from Cairns (there are half day trips too but they are not a lot cheaper). Other ways to do Green Island are a scenic helicopter flight (you still get time on the island too), a sailing cruise, and a three day trip from Cairns. Or, you can do Green Island on a two day reef and rainforest package combo that also takes you to Kuranda. Green Island. Poster by AllPosters. Click on thumbnail to buy. Fitzroy Island is a continental island, and while it's possible to watch corals here too, it has more serious bushwalks than Green Island. The only place to stay is the Fitzroy Island Resort; and the cheapest way to get here is by taking a day trip from Cairns. Fitzroy Island. Poster by AllPosters. Click on thumbnail to buy. There are also lots of nice places to eat and drink in different parts of the town. There is always good dining at the markets; the whole Cairns Esplanade (the street side, not the coastal walk) is lined with eateries and there are also plenty of pubs, bars and good restaurants on the streets around the City Place. Some of the most popular ones are Gilligan’s Bistro on Grafton Street, and Tandoori Oven, Sawaddee and Wool Shed on Shield Street. There is also plenty of good accommodation in Cairns. * Hotels include All Seasons Esplanade Hotel, All Seasons Hotel, Barrier Reef Escapes Hotel, Amaroo At Trinity, Aquarius Hotel, Beachfront Hideaway Hotel, Best New Chalon Hotel, Best Western City Sheridan Hotel, Plaza Hotel, Southside International Inn, Coral Tree Inn, Discovery Hotel, Great Northern Hotel, Hides Hotel, Hilton Hotel, Holiday Inn, Mantra Esplanade Hotel, Mercure Hotel Harbourside, Oasis Inn, Out Front Hotel, Pacific International Hotel, Palm Cove Beach Sarayi Hotel, Palm Royale Hotel, Park Regis City Quays Hotel, Pullman Reef Hotel, Quality Hotel Sheridan Plaza, Rydges Plaza Hotel, Rydges Tradewinds Hotel, Shangri La Hotel, Sunland Leisure Park Hotel, Sunshine Tower Hotel, The Hotel Cairns, and The Sebel Hotel. * Motels include All Round Motel Inn the Pink, Tropical Gardens Motel, Cannon Park Motel, Comfort Inn City Terraces, Heritage Motel, High Chaparral Motel, Rainbow Inn, and Tropicana Lodge Motel. * Backpacker Hostels, Lodges and Guesthouses include Cairns Beach House, Cairns City Backpackers, Cairns Holiday Lodge, Waterfront Backpackers, Calypso Backpacker Inn, Caravella Backpackers Hostel, Figtree Lodge, Gilligans Backpackers, Global Backpackers, Global Backpackers Waterfront Hostel, Nomads Backpackers, Nomads Esplanade Backpackers, Reef Backpackers Resort. * Resorts include All Seasons Gateway Resort, Angsana Resort, Bay Village Tropical Retreat, Blue Lagoon Resort, Bohemia Resort, Breakfree Royal Harbour Resort, Cairns Colonial Club Resort, Comfort Inn Trinity Beach Club, Coral Reef Resort, Coral Sands Beachfront Resort, Golden Sands Beachfront Resort, Grand Mercure Rockford Esplanade, Half Moon Bay Resort, Kewarra Beach Resort, Koala Beach Resort, Mango Lagoon Resort, Mantra Amphora Resort, Mantra Trilogy Resort, Marlin Cove Resort, Melaleuca Resort, Njoy Travellers Resort, Novotel Oasis Resort, Novotel Rockford Resort, Oasis at Palm Cove Resort, Peppers Beach Club & Spa, Q Resorts Cascade Gardens, Rainforest Grove Holiday Resort, Reef House Resort, Rydges Esplanade Resort, Trinity Links Resort. Sea Temple Resort, Skinny Dips Resort & Spa, The Lakes Resort, and Turtle Cove Resort. * Bed and Breakfast, caravan parks and other types of accommodation include Cairns Villa and Leisure Park, Floriana Villas, Jungara Bed and Breakfast, Rainforest Family Retreat, Royal Palm Villas, Queens Court Accommodation, Ningana Bed and Breakfast, The Reef Retreat, The Villas Palm Cove, The Retreat at Holloways Beach, Trinity on the Esplanade Villas, Tropical Queenslander Holiday Studio Family Rooms, White Rock Leisure Park Villas, and Zanzoo Retreat. North of the town are the Cairns northern beaches: Machans Beach, Holloways Beach, Yorkeys Knob, Trinity Beach, Kewarra Beach, Clifton Beach, Palm Cove, Ellis Beach and Wangetti Beach. Most are quiet small communities with a nice beach, but Yorkeys Knob gets lively around the sailing club; and Palm Cove is more like a heavily developed tourist town – not my cup of tea but if you like a lot of concrete buildings which house expensive hotels and posh restaurants, head there – the beach is beautiful. Cairns Northern Beaches are close enough to the city that you can stay there and still enjoy Cairns. Southernmost beaches are 5-10min drive away, while the northernmost ones are 20-30min. And there are regular bus services between the city and the beaches. In the accommodation section above, the accommodation on Northern Beaches is mixed in with the accommodation in the city. If you want to see them separately, see the separate page about Cairns Accommodation. Northern beaches. Poster by AllPosters. Click on thumbnail to buy.